I saw her from across the room. I recognized the colors first, then saw the form. It was Our Lady of Guadalupe, practically glowing in reds, greens and yellows on the plain white wall of the art gallery. As I moved closer, her colors broke into a jumble of squares, pixelating before my eyes. Printed on a 3-foot-square paper, the colors danced as shapes, and I marveled at how they came together into her image just a few feet away. Did others see the same thing as I did? What an interesting take on the Madonna in the modern world. Broken down into pixels. Religion challenged by modern society. Or was it about the recognition being in the heart more than the eyes? 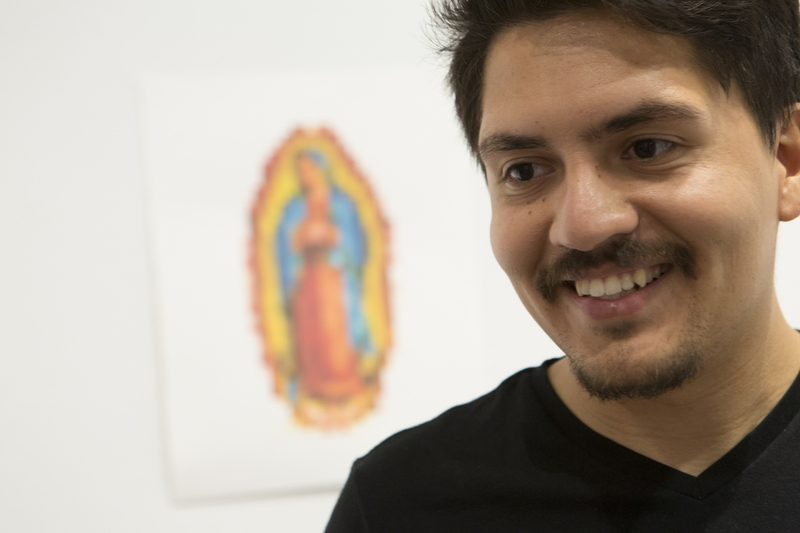 Artist Edgar Reyes and his take on Our Lady of Guadalupe. Photo by Cheryl Nemazie. That’s when I met the artist, Edgar Reyes. I soon found that Our Lady of Guadalupe had a very different meaning to him. He was born in Guadalajara, Mexico, and migrated to the United States with his mother as a small child. He still remembers saying goodbye to his grandmother, whose house was covered with images of the Virgin Mary. He and his young mother knelt down before his grandmother so she could bless them for a safe journey, all the mothers in his life seemingly melding into one at that moment. He got some help getting used to life in the States from an aunt in California (also named Lupe, by the way) and has overcome many hardships as an immigrant. Edgar is now an artist and teacher in the Baltimore/Washington, D.C. area. He carries a battered and well-traveled Guadalupe statue from the very town where Juan Diego first saw the Virgin Mary appear to him, bringing his cloak imprinted with her image to the bishop as proof. The iconic image is a touchstone to Reyes’ culture and an homage to the women who helped him get to where he is today. “For me what she stands for is respecting women. It’s not so much the religious component of her, but it’s what she stands for… it is woman empowerment and women’s rights…men should respect women… they are a valuable part of our community. They are not just child bearers. They hold the key to success to a fruitful community. She has always just been there for me. Guadalupe has guided my way through life indirectly and subconsciously. I grew up religious, but I’m very cynical about the Catholic faith. 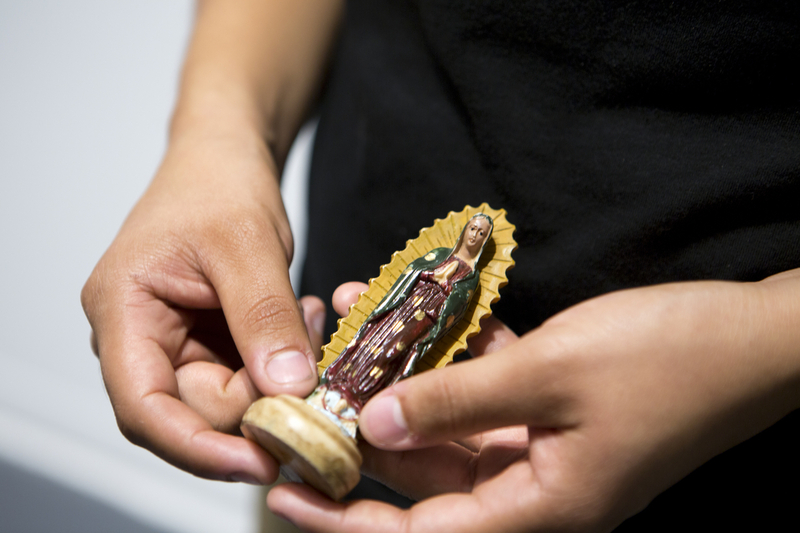 The Virgin Mary has become a cultural icon for many Latinos. Many of us are unaware of the fact that she was used as a vehicle for the colonization of Mexico and converting many native people. Despite this fact Latinos proudly wear her on their belts, necklaces and even get her portrait tattooed. I usually carry something in my wallet of her or relating to her. I just always have had something with her image on it. It is part of my culture. Guadalupe is a hybrid of Native American and Spanish beliefs. To me she is mother earth. The giver of life.